This Thing Called Life! : Make a Wish! How adorable is this little dragon?!! 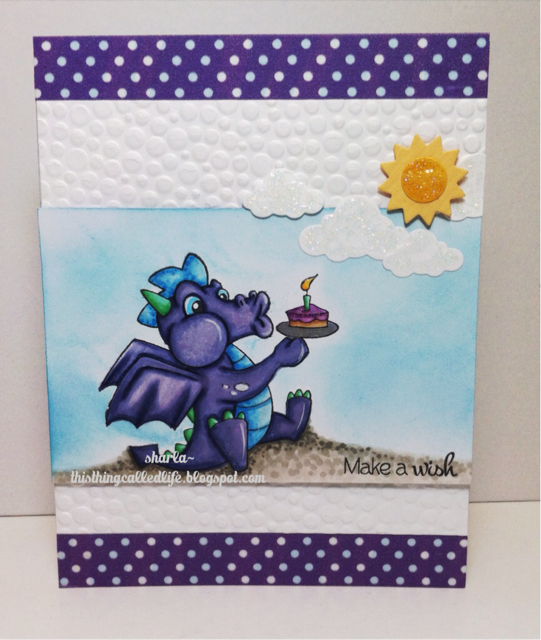 I love dragons and this little guy from Sugar Pea Designs is one of the cutest I've seen! the embossed folder is from Cuttlebug, the purple stripes are washi tape, the clouds and sun are from Taylored Expressions with clear stickles. I used the sketch #18 from Sugar Pea Designs. This is one of SPD faves too, Sharla! Love your take on him - fab layout! Thx for joining us at SPD! Cute card. The image is adorable and what a marvelous job of coloring. Amazing work here, Sharla!!! Thanks for joining in our 1st Birthday Party!!! What a cute dragon. I love the coloring. Thanks so much for playing along with us at Inspiration Destination this week. My son got me hooked on dragons when he was a kid....and now that he is grown I still think they are super cute! This one is colored beautifully Sharla! So very impressed with the entire card! So glad you shared it with us over at Seize the Birthday! Gorgeous coloring Sharla. So happy you joined in on celebrating SugarPea Designs' 1st Birthday with us. Love the scene you have created with that adorable dragon! Beautifully coloured too. Thank so much for sharing your creation with us at Seize the Birthday! Oh this is so super cute and I love the colors you used. Fabulous.